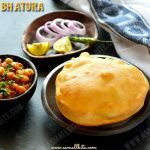 Bhatura Recipe in your home, believe me, that too quickly yes!!!. It is so easy without the addition of yeast or Eno salt and no overnight waiting time is needed for the fermentation of the dough. Actually, I have used sour curd and baking soda which quickens the fermentation process, so 2 hours is enough for the dough to get fermented. The bhatura’s was really soft inside, crispy outside with a beautiful golden colour crust and absolutely absorbed much less oil than the ones in restaurants. The Bhature will be slightly thicker than the regular poori and takes little extra time to get cooked. 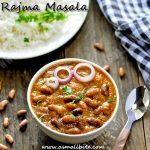 I always pair it up with Punjabi Chole but sometimes with Rajma masala or Dal Tadka too, whatever may be the side dish, it tastes so delicious. Also, I have shared this Punjabi Bhature Recipe with step by step pics, a short youtube video and if you like it, don’t forget to subscribe to my channel. 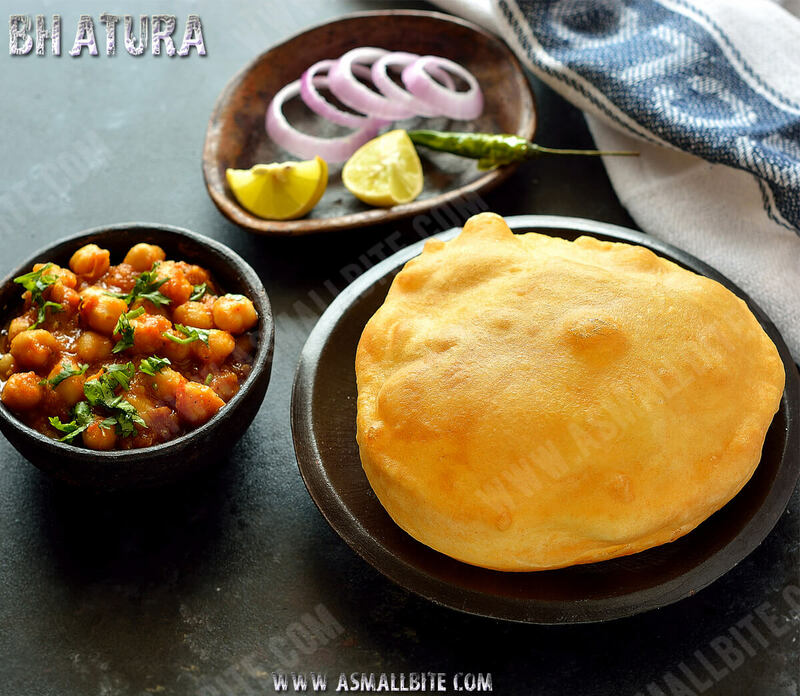 Punjabi Bhature recipe / Bhatura recipe will be slightly thicker than the regular poori and takes little extra time to get cooked. I always pair it up with Punjabi Chole but sometimes with Rajma masala. 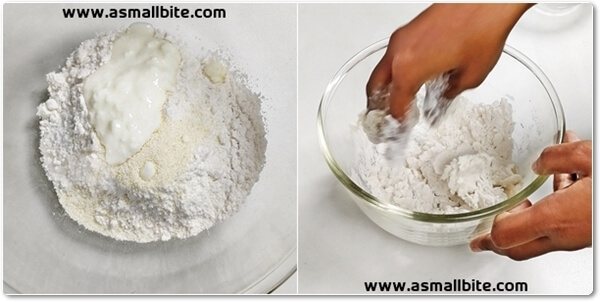 To a wide mixing bowl, add maida, sooji, baking powder, salt, sugar and curd. First mix the flours without adding water, it looks crumbled now. Now add very little water, 1 tsp of oil and knead the dough for a minimum time of 6 to 8 minutes. The dough should be smooth at the same time stiff too. Cover the dough with a damp wet cloth and keep it undisturbed in a warm place for a minimum time of 2 hours. The dough would have increased in size now and very small holes will be seen. If it has not increased in size, set aside for a few more hours. 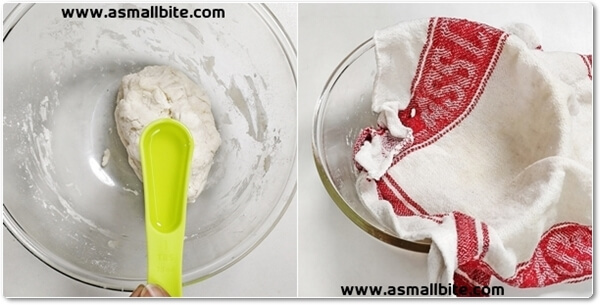 Now divide the dough into equal portions and roll it into small balls without any cracks. Place the dough balls in the rolling board. Apply little oil over the ball and start rolling it into a circle or oval shape bhaturas. The thickness of the bhature should be medium, not too thick or thin and ensure there are no holes. Keep it in a plate or paper not overlapping each other. 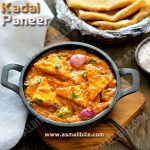 Heat enough oil in a kadai, drop a small piece of dough and if it raises immediately, the oil temperature is perfect. The oil should not be fuming, else the bhatura turns brownish immediately. Now drop the bhatura into the oil and when it starts to fry a little, press it on top very gently so that it puffs very well. Also, pour little hot oil from the kadai with the same ladle over the bhatura and flip to the other side. Allow it to cook for 3 to 4 secs till the bubble ceases. Adjust flame accordingly and continue the same steps with remaining dough. 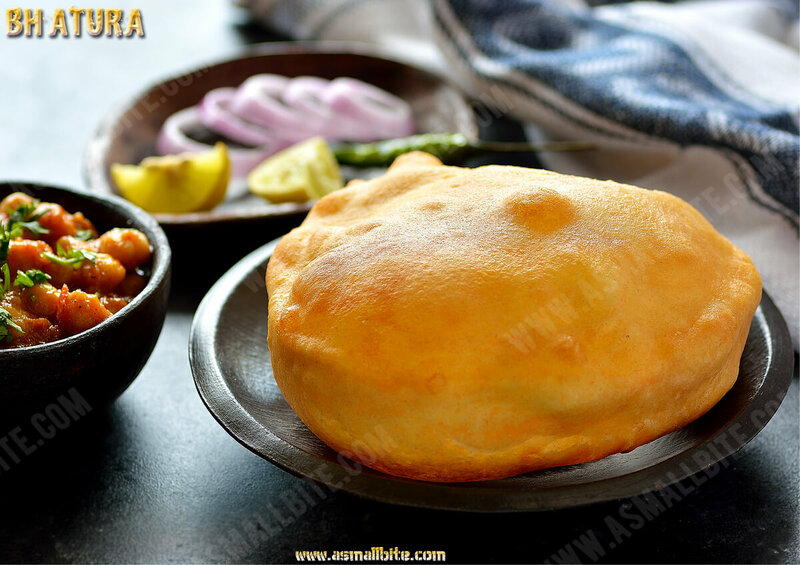 Enjoy this Bhatura Recipe with Green Peas Kurma. 1. Addition of sooji gives crispiness and the bhature don’t break after it cools down. 2. Don't skip the sugar as it lends a nice golden colour to the Bhatura Recipe. 3. Kneading the dough properly for a minimum time of 5 minutes at least is a must, to get a perfect Punjabi Bhature Recipe. 4. 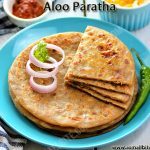 I suggest using sour curd as it quickens the fermentation process of the dough and gives softness to the bhatura. 5. Also, set the dough aside for a minimum time of 2 hours in a warm place, so it gets fermented/ leavened(material such as baking powder used to produce a gas that lightens dough or batter) well. 6. 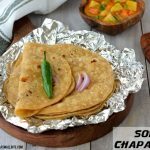 The thickness of the bhature while rolling should not be thick or thin and it should be medium. 7. Also, if there are any holes in the bhatura while rolling, it won't puff up. 8. The oil temperature should not be fuming, else the bhature turn brownish and tastes bitter. 9. Also, the oil temperature should not be low, just retain the temperature accordingly. 10. The dough can be stored in the refrigerator properly and can be used for a day. 2. To a wide mixing bowl, add maida, sooji, baking powder, salt, sugar and curd. First mix the flours without adding water, it looks crumbled now. 3. Now add very little water, 1 tsp of oil and knead the dough for a minimum time of 6 to 8 minutes. The dough should be smooth at the same time stiff too. Cover the dough with a damp wet cloth and keep it undisturbed in a warm place for a minimum time of 2 hours. 4. The dough would have increased in size now and very small holes will be seen. If it has not increased in size, set aside for a few more hours. 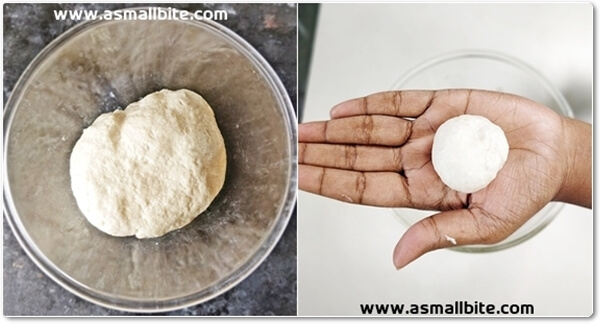 Now divide the dough into equal portions and roll it into small balls without any cracks. 5. Place the dough balls in the rolling board. Apply little oil over the ball and start rolling it into a circle or oval shape bhaturas. The thickness of the bhature should be medium, not too thick or thin and ensure there are no holes. Keep it in a plate or paper not overlapping each other. 6. Heat enough oil in a kadai, drop a small piece of dough and if it raises immediately, the oil temperature is perfect. The oil should not be fuming, else the bhatura turns brownish immediately. 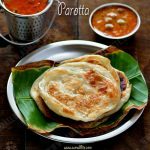 Now drop the bhatura into the oil and when it starts to fry a little, press it on top very gently so that it puffs very well. Also, pour little hot oil from the kadai with the same ladle over the bhatura and flip to the other side. Allow it to cook for 3 to 4 secs till the bubble ceases. Adjust flame accordingly and continue the same steps with remaining dough.